It's finally here, after a long road. At the bottom of this post you'll see a list of changes from the Beta update. From the bottom of our hearts, thanks to all of you that put up with us on this long journey for our small game. For a bit of fun, compare this to our OLD Greenlight Trailer from 2013! The Beta was the last News announcement we posted, but we've been releasing small updates and maintaining a thread on the old Early Access general forum of the patch notes. Here is a complete list of all changes since the Beta update. Improved Windows Fullscreen support. Now by default Fullscreen means Exclusive mode on Windows and Borderless Windowed fullscreen is now a Steam launch option. Unfortunately this is a Unity engine limitation, but unlike most Unity games, we wanted to give you the option to have both. Fixed Spear holding units getting the Spear vs Cavalry combat bonus when engaged with another unit. They should only get the bonus when they fight back. Campaign 04's remaining missions have been released, this is 4-2, 4-3 and 4-4. This campaign culminates in the epic Battle of Changping which set the State of Qin up for total dominance over the rest of the Warring States of China. This large map has you battling over a 4-way crossing of rivers interlocked with bridges. Suited for 4 players, but can be played with 2 as well. This medium map promotes a game of cat and mouse with numerous bridges, forests and hills to gain an advantage over your opponent, prepare ambushes and launch a counter attack after throwing back their attack. We have done a pass over all multiplayer maps and their modes for balance. Siege levels now have clear capture points within the forts to end the battle as well as much larger deploy areas around the forts giving the attacker more choice, and less time is spent running up to the walls on the larger maps. Every single mission has been tweaked, reworked, balanced and adjusted to feel a steady progression of unit availability, difficulty and flow. Some missions have had major adjustments done to get this to work better (for example 2-1 with new ambush mechanics from the AI). AI can now use Special Attacks! Previously they did Reinforce but that was about it. Be careful though, because they can really mess you up now with clever AOE attacks and displacements when you weren't expecting it before. This is a small change on the list, but probably one of the biggest impacts to the game when playing against AI. We have also done some significant overhauls of the AI that make them much more aware of tactically important tiles and how to manipulate Special Attacks to their advantage. For example, if you're standing on a capture point the AI will now use displacement attacks to push you off of it. We have added a cheaper and smaller ranged special attack, Salvo. This hits all enemies in a direct line, but you have to make sure they line up! Use this when Arrow Eclipse is just too much. This attack is also available on lower tier units, where Arrow Eclipse is not. There have been a few fundamental improvements to combat as we balanced every aspect of the game. This is a big one. We've introduced Line of Sight to ranged attacks. Not all buildings block it, but the obvious ones do. This primarily came about as we felt it was weird that defending a castle meant having archers on the ground behind the walls, trading shots with archers outside the walls. 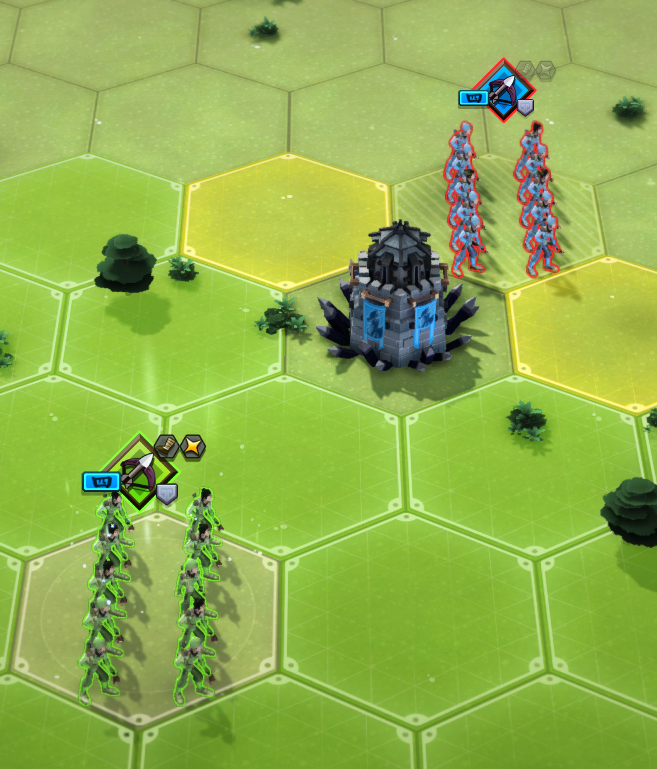 Now walls and towers will block Line of Sight and force you to rethink your approach, defending or attacking. Morale was behaving a bit incoherently. We had a lot of hidden mechanics like if you were low health, you could take multiple morale hits at the same time. This made it feel like you could break really easy for no reason when this 'rolled' against you. Additionally ranged attacks were too good at causing morale tests and breaking enemy units, which goes against how we feel combat should work. We've removed these spikes and made it totally transparent. Now you cannot cause morale tests with ranged attacks unless a unit is significantly low strength already. We've also reduced the impact of the Under Fire debuff and introduced some new ones to compensate. Now we have added the Flanked and Charged/Cavalry Charged debuff that happens when (as you can guess) you Flank or Charge a unit. This puts a one-turn but significant Leadership debuff on the unit. This also makes it feel more plausible that you're flanking and crashing cavalry into a unit, causing real terror. These new debuffs plus the removal of multiple morale level losses in one have really smoothed out the way morale is lost in fights and should feel far more predictable. It also rewards good tactical behaviour more directly. Unit costs have been totally redone across the board and now much more closely represent their power. If a unit costs more, in general, it should be better barring specific tactical situations. We have also done a major pass on unit values to ensure each type of unit at each tier had a purpose and style, as well as making sure the tiers battling each other were well balanced. We have done a pass balancing the cost of special attacks, their damage and how quickly you earn Tactics Points. There should be a steady feeling of always being able to spend tactics points and not being forced to conserve them. Reinforce has been tweaked to now only give 25% of your maximum strength, but the cost has been reduced to compensate. This should stop it being the unstoppable tanking action and also make it so you can spread the value of your Tactics Points across your army. Previously, you could use the Rally action to try to raise the Morale of a unit that wasn't broken, but this actually used the Leadership stat and had a chance of failure, just like a Rally. This felt unfair to waste an entire unit's turn on, so now we have split it into a new action that replaces Rally when a unit is not broken. Raise Morale always succeeds and always raises your morale a level. Charging is fun and as part of the balancing we have made it much cheaper to do. Unused/Leftover Deploy Points are now converted to starting Tactics Points at the beginning of a mission. So you no longer feel sad that you just couldn't quite spend those 50 remaining points. Previously, the default action of a unit could execute with Right-Click (move, attack) but when you selected an action directly you had to finish with Left-Click. In the end this felt unneccessary and clunky so we've changed it to all be Right-Click for consistency. You can now select units by clicking on their flag. The tooltips used to work on the flags as well, so why not selecting? Done! When deploying it now keeps your previous selection so if you want 3 Light Archers just keep clicking on the map to keep deploying them. The Options menu now has tooltips explaining what the unclear options do specifically. This is a favourite of mine...you can now toggle the speed of animations between 1x and 2x speed. You can even set it to always be 2x in the options! The toggle is Spacebar by default, but is of course rebindable in the options. You can not set the maximum number of characters in a unit for performance. We know many of you play on lower end machines or laptops with very hot CPUs when running a game, and this is for you. Along with strict frame limiting options and the ability to limit the number of characters in a unit, the game should be quite playable on a low-end machine. A ton of optimisation work has gone on to reduce frame spikes and overall cost of frames. One example is when lots of units moved at once in a cutscene there was some serious hit to the performance. A big rewrite of our underlying coroutine usage here has wiped this specific spike totally out. More bug fixes than we can even count have gone into this, but I love mentioning it. It's the silent work that doesn't make for a good headline or update note, but really improves the quality of the game as a whole. We've added 4 new Multiplayer/Battle Maps (2 small, 2 medium). There is an additional large map coming next week, but we didn't want to delay the update. This update includes numerous bug fixes (especially related to AI) and additional gameplay balancing. Welcome to our new website! Check back often for latest updates regarding the game Warring States Tactics. Our team are continuously working on many updates to enhance the game play experience , as well as making fixes. Our Team will always try to answer any technical queries as soon as we can.